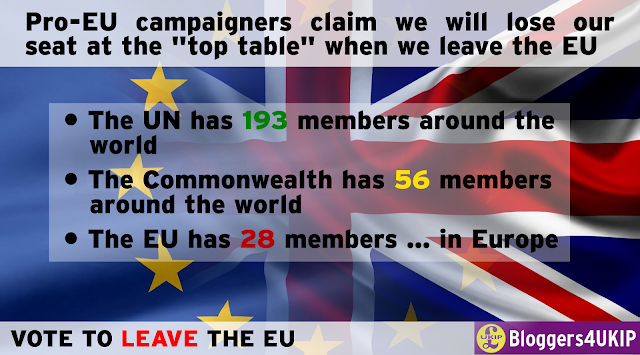 Bloggers4UKIP: BSE claims EU membership is having a seat at the "top table"
BSE claims EU membership is having a seat at the "top table"
The mad cows at BSE have come up with this dodgy graphic to tell people that leaving the EU will mean we won't have a seat at the "top table". You might be wondering what leaving the EU has got to do with the United Nations but they don't mean the 193 member global organisation with a presence in almost every country in the world, the "top table" is apparently in Brussels with its mere 28 members. The UK is an active member of the UN with one of the five permanent seats on the UN Security Council and the UN Trusteeship Council. We are founder members of NATO and the Commonwealth, members of the Organisation for Economic Co-operation and Development, Organisation for Security and Co-operation in Europe, Western European Union, International Monetary Fund, the World Bank, Euro-Atlantic Partnership Council, the G20 and G8 and many more. Far from losing a seat at the "top table" when we leave the EU, we will regain our World Trade Organisation seat which we had to give up to allow the EU to conduct all our trade negotiations for us. In terms of trade, the WTO is the top table. In terms of diplomacy and international relations, the UN is the top table. The EU is a 28 member regional body accounting for just 17% of the global economy and a fifth of that is down to the UK.